All Seasons Bistro is a Napa Valley classic, celebrating 40 years of offering wine country cuisine with Napa Valley wines in mind. 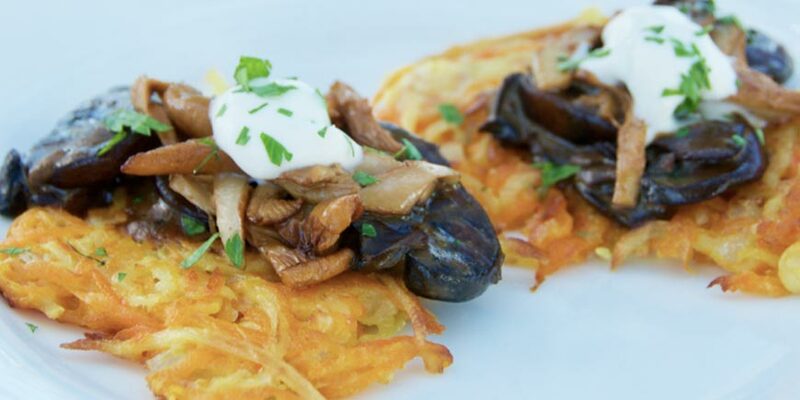 The pancakes with mushroom ragout can be served as a side dish for dinner or as a main dish with a salad for lunch. While the pancakes could certainly be a light lunch main course, we offer it as an appetizer. 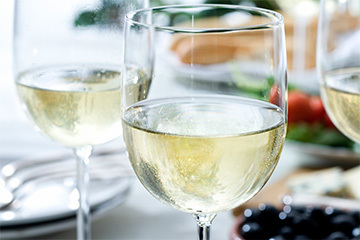 We like to have a fair amount of our appetizers suitable for white wines and Chardonnay is the ideal first course wine. Even in a leaner style, it still has the mouth feel and tremendous flavors to complement the richness of the butternut squash and the mushrooms. It strikes the right balance with its natural texture and weight compared to the round earthiness of these cool weather flavors. Toss the grated vegetables with the 2 tablespoons of salt and allow to sit for 30 minutes (this would be a good time to make the mushroom ragout). Squeeze liquid out of grated vegetables (using a kitchen towel to do this in batches works well). Place grated vegetables in a large bowl. Toss shallots, thyme leaves, baking powder, flour, cayenne and salt and pepper with grated vegetables, mixing well. Whisk the 2 eggs in a small bowl. Stir into vegetable mixture. Heat 2 tablespoons of grapeseed (or canola) oil in a large skillet over medium heat. Scoop out a heaping tablespoon (about 2 tablespoons total) of the vegetable "batter" and place in hot oil (repeat with 3 more heaping tablespoons for this batch). Flatten to 1/8-inch thick pancakes with a fork. Cook, turning once, until nicely browned on both sides, about 5 minutes. Remove to paper towels and sprinkle lightly with salt. Place the dried mushrooms in a Pyrex measuring cup or a bowl and pour 2 cups boiling water over mushrooms. Let soak 30 minutes, while you prepare the other ingredients. Place a strainer over a bowl, line it with cheesecloth or paper towels, and drain the mushrooms. Save the liquid. Squeeze the mushrooms over the strainer and rinse until they are free of sand. Chop coarsely. Heat the olive oil over medium heat in a large, heavy skillet or a wide saucepan and add the shallots or onion. Cook, stirring often, until tender, 3 to 5 minutes. Add the fresh mushrooms and thyme, and turn up the heat slightly. Cook until the mushrooms begin to sweat, then add a generous pinch of salt. Stir for about 5 minutes over medium-high heat as the mushrooms continue to soften and sweat. Add the flour and continue to cook the mushrooms, stirring, until they have softened a little more and you can no longer see the flour, about 2 minutes. Add the reconstituted dried mushrooms and the wine and turn the heat to high. Cook, stirring, until the liquid boils down and glazes the mushrooms, about 5 minutes. Stir in the dried mushroom soaking liquid, bring to a simmer, add salt to taste, and cook over medium-high heat, stirring often, until the mushrooms are thoroughly tender and fragrant and the surrounding broth is thick, about 10 to 15 minutes. Remove from the heat, stir in the crème fraîche, some freshly ground pepper and adjust salt, to taste.